Welcome to Pipe Babes 2014! To see the archives of Pipe Babes from 2013, look here, from 2012, look here, or from 2009 - 2011, here. "Pipe Babes" is not meant in a derogatory way. It is a compliment to any woman to be called a "babe". In our observations, even women check out other women. Did you ever notice that men’s magazines usually have a beautiful woman on the cover? Did you ever notice that women’s magazines also usually have a beautiful woman on the cover? Of course, the men are looking because … uh … we’re men! The women are looking because they are making comparisons, sizing up the competition, and getting ideas for themselves. Say hello to our newest Pipe Babe, Coley. She has beautiful, luxurious, long hair down to her derriere, and she frequently serves drinks to PipesMagazine.com publisher, Kevin Godbee. Coley has been bartending for 14-years, and is a Florida native. With the hot, humid FL weather and her long hair, she frequently puts it into a ponytail, which is named Penelope—Godbee's martini-fueled idea. Speaking of names, her pet Yorkie is named Mr. Oliver Ruggles. As if it's not cool enough that she smokes a pipe, she used to have her own jewelry line called Cole 45. All of the designs involved bullet casings from guns that she actually shot. She says; "I also shoot primitive bows and arrows and other kinds of stuff." One of her favorite animals are snails. "I have loved them since I was a kid and I have 7 pet snails." Her drink of choice is Jim Beam Bourbon, and her tobacco favorites are English and Virginia. Coley hopes to retire by owning a doggie daycare "so I can play with furry babies all day long." When she turned 30, she got rid of all of her belongings and drove to California and back "just to see the country." She has a passionflower tattoo on her left wrist, her favorite band is Pink Floyd, and her hair is naturally purple. This shoot was done at Central Cigars in St. Petersburg, FL. 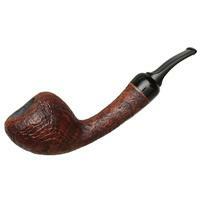 Coley started out smoking an Erik Nording Partially Rusticated Bulldog, and then moved on to a Comoy's Tradition (1950s Era) pipe from Godbee's personal collection. Photos by Barry Lively of B. Lively Images. Hair & Make-up by Brittany Addison of Addison at Create. Sherye has her Bachelors Degree in Psychology with an emphasis on behavioral analysis and modification. Currently, she is an Account Executive for a company specializing in event decor. She is big animal lover and advocate, and she is always pushing others to stay positive, motivated, and to keep smiling. In this shoot she is smoking an Adam Davidson Military Mount Billiard with Silver Band (2013) from Kevin Godbee's collection. This shoot was done at Central Cigars in downtown St. Petersburg, Florida, a full liquor and cigar bar with several name brand cigars and their own house blends as well. It is attached to Ruby's Elixir which is a great Jazz & Blues club. Smoking is permitted not only in the cigar lounge, but in the jazz club as well. Photos by Barry Lively of B. Lively Images. Hair & Make-up by Brittany Addison of Addison at Create. Melania makes her debut here on PipesMagazine.com smoking an Adam Davidson pipe from Kevin Godbee's collection. The pipe is a Ruby Red Lorraine, 4.75" long with Sterling Silver Military Mount (2014). Melania is a 22-year old student, a professional ballroom dancer and this year holds the title of Queen of the National Floral Games of Mexico, which is a poetry contest held in one of the most important oil hubs in Mexico. She has won several international dance competitions. Born in Mexico and raised overseas, she is truly a third culture kid. She is fluent in English, Spanish and Mandarin-Chinese, reflecting her formation as a child. She is currently pursuing her degree in Oil and Gas Accounting. This shoot was done at Central Cigars in downtown St. Petersburg, Florida, a full liquor and cigar bar with several name brand cigars and their own house blends as well. It is attached to Ruby's Elixir which is a great Jazz & Blues club. Smoking is permitted not only in the cigar lounge, but in the jazz club as well. Photos by Barry Lively of B. Lively Images. Hair & Make-up by Brittany Addison of Addison at Create. This is Vanessa's 2nd appearance here at PipesMagazine.com. We love that she has the greatest, shiniest, silkiest, longest black hair ever. Vanessa's exotic looks come from her Peruvian descent. She currently resides in Sarasota, Florida where she enjoys the tropical weather and the beach. Her stepfather is artisan pipe maker, Zack Hamric, which is how she came to our attention. Zack is a participating member in the community forums on PipesMagazine.com under the screen name of zack24. He posted photos of his vacation in Italy last summer, which included photos of his lovely wife, Greta, and stepdaughter, Vanessa smoking pipes. It turns out that Vanessa is an actual, albeit, occasional pipe smoker. She didn't need any coaching whatsoever. Pipe smoking never looked so pretty, and to add to Vanessa's wonderfully glamorous appearance, she is smoking a beautiful freehand pipe made by her step-dad. You can find his pipes at http://zhamricpipes.com/. Camae is a bubbly, petite, cutie with beautiful, long, flowing brown hair. Originally from New York, and now residing in St. Petersburg, FL, this 28-year old Virgo enjoys smoking a pipe on special occasions. You may also see her smoking a cigar at Central Cigar Bar in downtown St. Pete. In this shoot, Camae is smoking a 2013 Comoy's Tradition Billiard (182) with Saddle Bit. The Comoy brand was brought back last year by distribution company Phillips & King, and it is being made by Chacom in France. (Chacom was originally an offshoot brand of the Comoy company from their French factory in the early 1920s.) 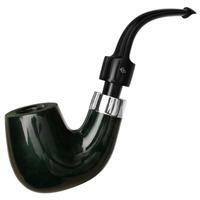 This is a perfect recreation of the original model pipe that was made in England decades ago. You can read more about this here. Gabrielle made her debut on PipesMagazine.com in 2012. This is her 8th appearance as a Pipe Babe since then. In this shoot she is smoking Kevin Godbee's 2002 Dunhill Cumberland shape (4202), which is a half bent billiard with saddle bit. The tobacco is My Own Blend, which was custom hand-blended to Kevin's taste, at the Orlik Factory in Denmark during his visit there in July 2010. The shoot was done at Ruby's Elixir, which is a great Jazz & Blues club in downtown St. Petersburg, Florida. Ruby's is attached to Central Cigars, a full liquor and cigar bar with several name brand cigars and their own house blends as well. Smoking is permitted not only in the cigar lounge, but in the jazz club as well. Say hello to our newest Pipe Babe, Gina Roode. Gina is a full time musician with an album of her own original acoustic guitar songs. She is self-taught, and has a quite unique style of playing the guitar. Check out her impressive skills and style in this YouTube Video. 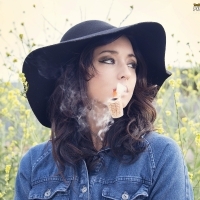 She also performs live almost every week at various locations in Southern California, and she is a pipe smoker in real life. You can hear her interview on The Pipes Magazine Radio Show here. Vanessa's exotic looks come from her Peruvian descent. She currently resides in Sarasota, Florida where she enjoys the tropical weather and the beach. Her stepfather is artisan pipe maker, Zack Hamric, which is how she came to our attention. Zack is a participating member in the community forums on PipesMagazine.com under the screen name of zack24. He posted photos of his vacation in Italy last summer, which included photos of his lovely wife, Greta, and stepdaughter, Vanessa smoking pipes. It turns out that Vanessa is an actual, albeit, occasional pipe smoker. She didn't need any coaching whatsoever. Pipe smoking never looked so pretty, and to add to Vanessa's wonderfully glamorous appearance, she is smoking an exotic-looking acorn-shaped pipe with bamboo stem made by her step-dad. You can find his pipes at http://zhamricpipes.com/. For the month of March, we'd like to introduce you to our newest Pipe Babe, Camae. She is a bubbly, petite, cutie with beautiful, long, flowing brown hair. Originally from New York, and now residing in St. Petersburg, FL, this 28-year old Virgo enjoys smoking a pipe on special occasions. She is a natural at it and got some pretty nice smoke. In this shoot she is smoking one of the 4th Generation Pipes from Erik Stokkebye. 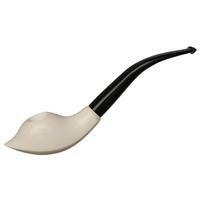 This sandblasted black pipe is the 1897 model. 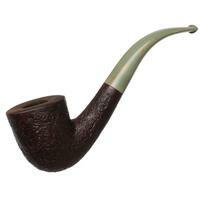 It is made in Denmark of Italian briar. It has a bronze band engraved with the 4th Generation logo, and a bent acrylic stem. More information on 4th Generation Pipes can be found here. You can shop for them at PipesAndCigars.com. Gabrielle is enjoying smoking G. L. Pease Maltese Falcon in a Smitty Pipe from Edward's Pipe & Tobacco in Tampa, FL. We shot these photos of Gabrielle at Ruby's Elixir, which is a great Jazz & Blues club in downtown St. Petersburg, Florida. Ruby's is attached to Central Cigars, a full liquor and cigar bar with several name brand cigars and their own house blends as well. Smoking is permitted not only in the cigar lounge, but in the jazz club as well. We start the year off with Julia smoking a Luciano Smooth Dark Contrast Slightly Bent Apple #255. She seems to be enjoying it quite a bit.